Former hunger-striker Mahmoud al-Sarsak arrived on Tuesday in the Gaza Strip after being released from Israeli custody. Relatives gathered at the Palestinian side of the Israeli Erez crossing in northern Gaza to welcome the freed prisoner, who refused food in Israeli jail for over 90 days to protest his imprisonment without charge. He was transferred to Shifa hospital in Gaza City for medical attention, where hundreds gathered to greet the former hunger-striker, who looked in a stable condition, a Ma’an reporter said. Senior Islamic Jihad leader Nafith Azzam held a news conference at the hospital pledging to continue solidarity activities supporting Palestinian prisoners in Israeli jails. “Mahmoud al-Sarsak has his name written in the records of honor and glory, and what he did will make us more adamant to stand in the face of occupation,” Azzam said. 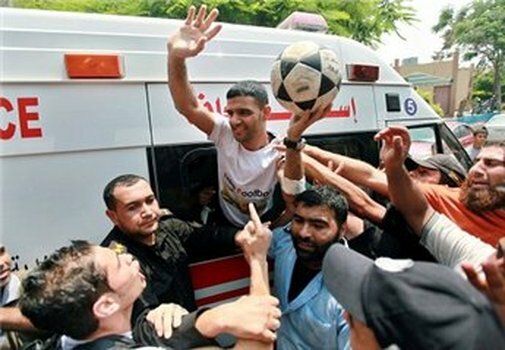 The 25-year-old soccer player from the Gaza Strip had been imprisoned by Israel without charge or trial since July 2009. He agreed to end his hunger strike on June 18 in return for his release. He was not included in a May deal which ended mass hunger strikes in Israeli jails, and an offer to free him was withdrawn by Israeli authorities after he asked for his release date to be put in writing, prisoners rights group Addameer says.